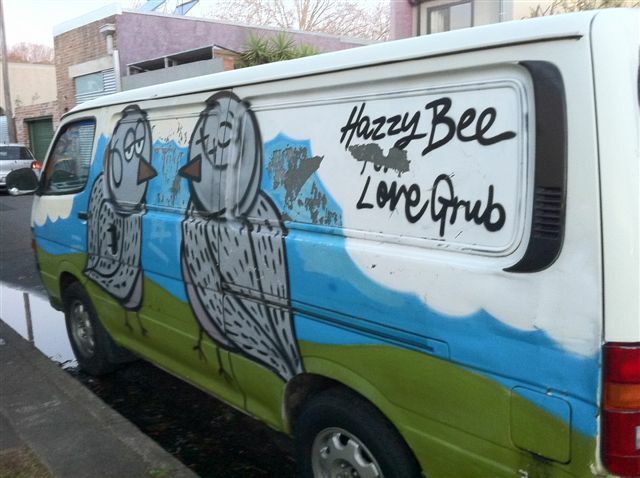 Hazzy Bee mural at the Love Grub cafe, Mitchell Road. Images below by Allison Burness. 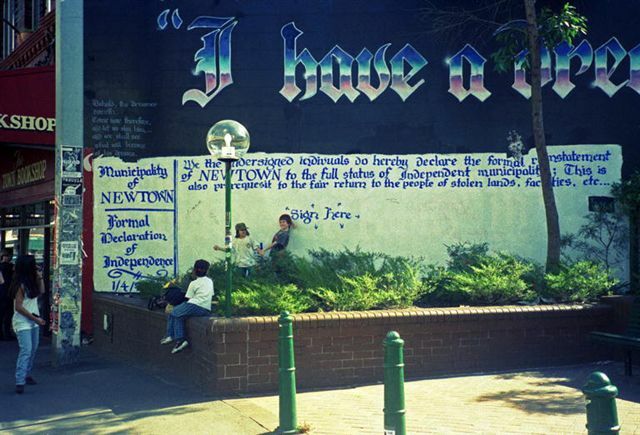 In the early 1990’s, under the handle Unmitigated Audacity Productions, artists Juilee Pryor, Andrew Aiken, Tony Spanos, and others such as Matthew Peet and Tim Guider, painted a number of Newtown’s most iconic murals. 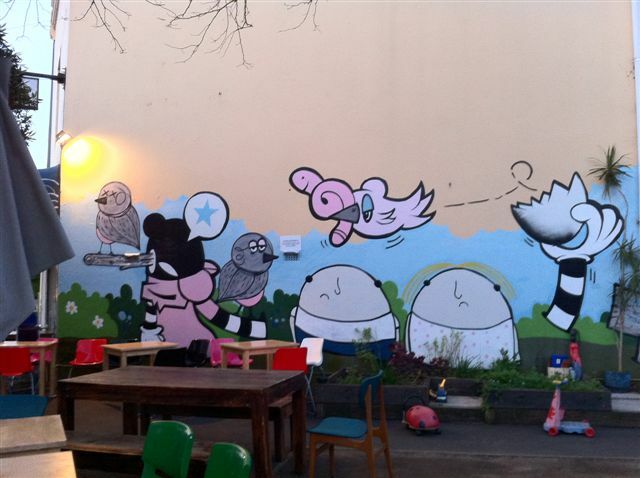 Below is a selection of images of the various murals. 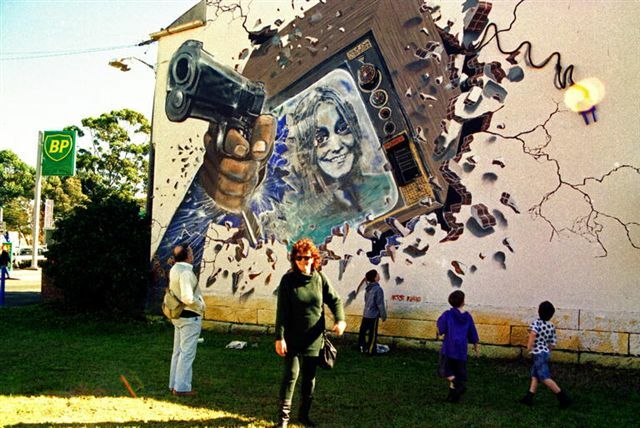 For further Unlimited Audacity images please search on the mural title in our archival image gallery Archivepix. 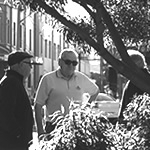 Images and text by Juilee Pryor, photographer and collection : Newtown as imagined by Unmitigated Audacity Productions 1991-1995. This was the very first mural that Andrew & I painted together, and was the beginning of the Unmitigated Audacity Productions collaboration. 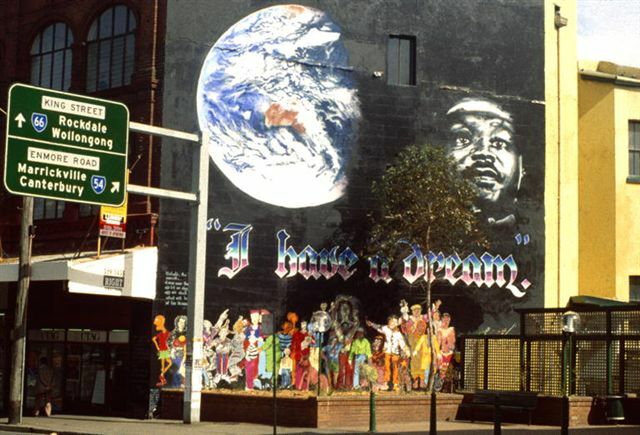 We had met only a few days previously and were already discussing the possibility of doing the big I Have a Dream mural on King Street Newtown but thought it might be a good idea to try something a little smaller to see if we could actually work together first. 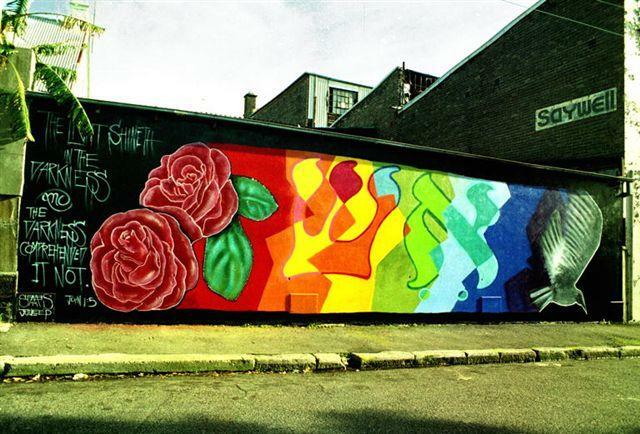 This mural located on Rochford Street just a block away from my home and was painted in late July 1991. This mural is located on a wall facing 596 King Street and is a copy of the famous photograph of the Native Indian leader Geronimo. The Aboriginal flag on the sleeve of the figure is to tie the spirit of Geromimo in with the land rights activism of local Aboriginal people. Also this mural declares the importance of South Newtown as a cultural space separate to that of North Newtown. Painted by Andrew in 1992 or 1993 and assisted by Tony Spanos & Juilee Pryor. This mural was Artist funded. 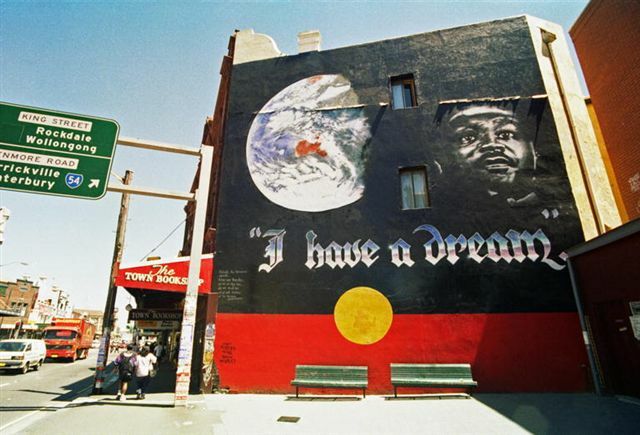 This image of the mural was taken some months later and shows how messy the image has become as others add their own sentiments to the artwork & so on. Andrew also regularly added statements to street art that he has been involved in, a kind of ongoing conversation with others. These ongoing conversations were not always polite. This mural was on John Street Erskineville which is a small side street down the southern end of King Street. It was thrown up one night in 1992 and is an interpretation of an old master painting “The Head of John the Baptist” by Leonardo Da Vinci. It was painted by Andrew with my assistance but was repeatedly tagged with Nazi emblems and very provocative racist graffiti so did not survive long before being painted out. This mural was Artist funded. My three small boys pose in front of the mural in this image. By 1992 Andrew had become fascinated by the artworks of the old masters and would make various attempts at them before working in public. These artworks were Artist funded.After practicing his Monas on various parts of my home Andrew made this one on the exterior of the shop on the corner of the King Street and Erskineville Road. 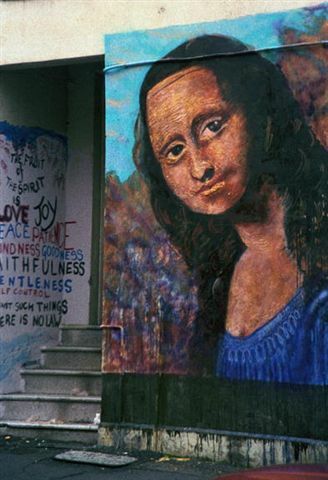 This mural is one of the few that survive today (2010). 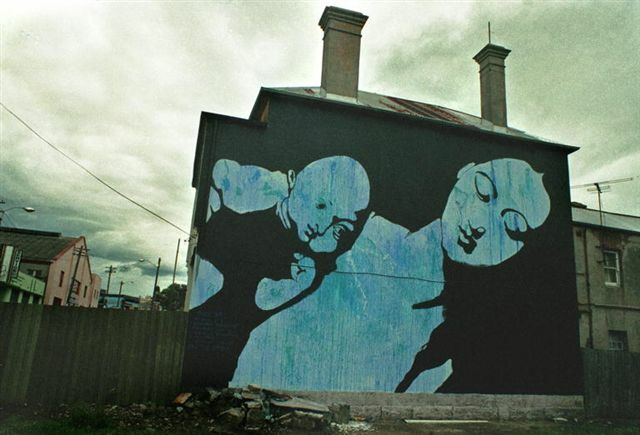 This mural, on the side of a two story house on Erskineville Road, was an interpretation of an old master painting. It was widely interpreted to be an anti-abortion statement but that is not correct. 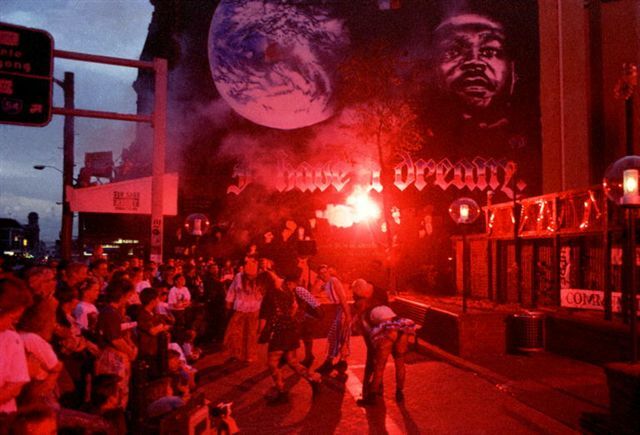 The adjoining block of land was sold and redeveloped and the mural disappeared from sight. This mural was created in 1992 or 1993 and was artist funded. The mural was thrown up very quickly over the course of one night and attracted a very negative response very quickly. It was assumed to be an anit abortion image and collected alot very strident tagging very quickly. Andrew’s Christianity was well known and people made assumptions based mostly on that. This is another mural Andrew completed by himself in 1993. It was on the side of the African restaurant next to the church that was one of the bases of operations for the work done by Unmitigated Audacity Productions. 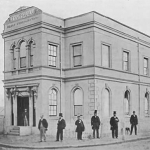 The other base of operations was my house on Rochford Street in Erskineville. This mural was partly paid for with scrumptious African food from the restaurant. 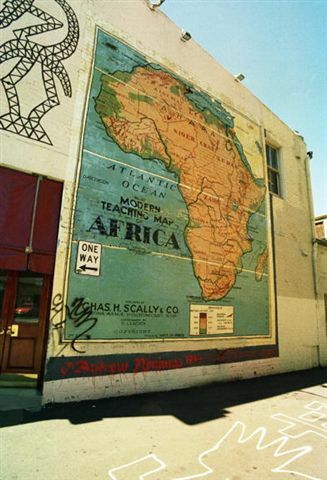 This mural was one of a series of large works on Erskineville Road and was painted by Andrew and Tim Guider in 1993. It was in situ for quite some years (more than ten years). It was a commentary on the power of the media and an invitation to think about that in a different way. It was the beginning of more sculptural, tactile works. This mural was Artist funded. 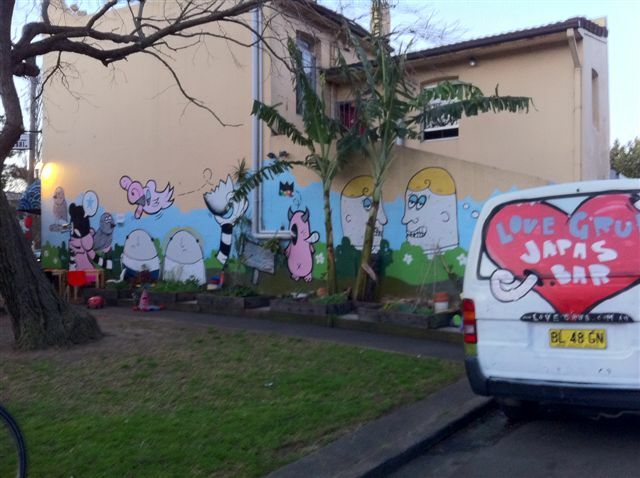 In this image my family get a close up view of the latest mural on Erskineville Road. These murals were appearing at a very fast rate and and no-one seemed to know where the next one would appear. Many people wanted to commission one to articulate their own particular point of view but Unmitigated Audacity Productions didn’t really work like that. 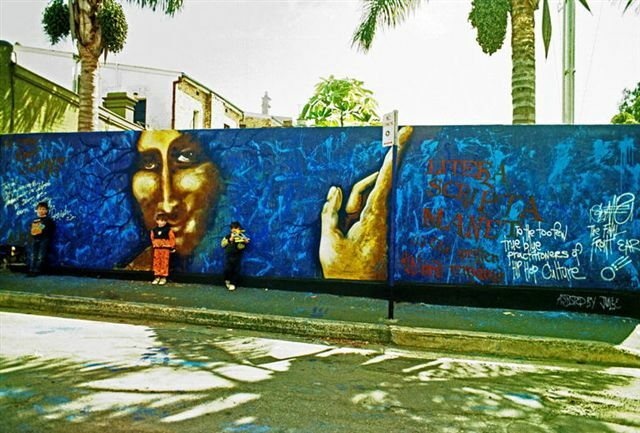 This is one of the first big murals Andrew undertook (probably in early 1991) and it was in a small pocket park close to the corner of Wilson Street and Erskineville Road. It depicts Miles Davis and was widely admired and loved by the community and and was in situ for a long time (more than ten years). This mural was Artist funded. 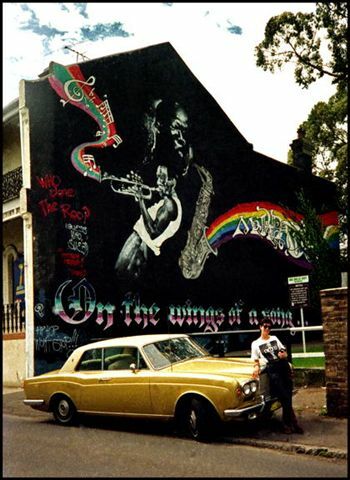 A frontal view of the mural with me posing in front of it on Tony Spanos’ gold Rolls Royce. 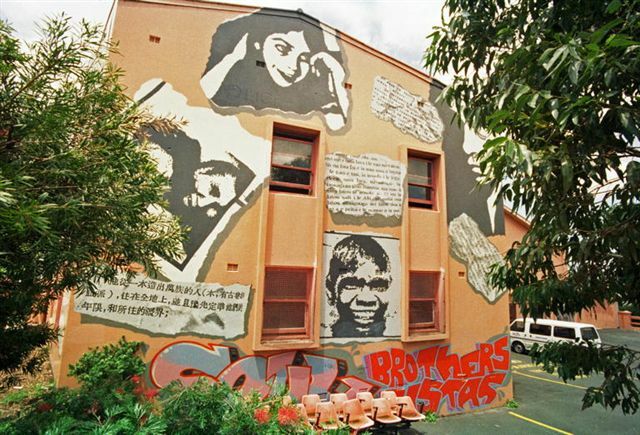 Andrew and Matthew Peet collaborated to produce this mural on the exterior of the Newtown PCYC back in late 1993. The muralling work done by Andrew and Matt was widely admired and suffered no real damage by way of tagging. This was a commissioned job and was paid for by the PCYC. This image is a view of the front wall of the PCYC. 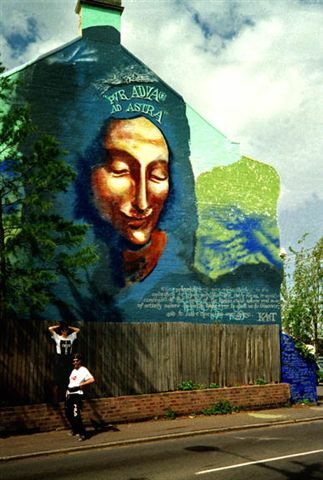 This mural was another one from 1992/3 that was styled in the manner of an old master painting of the Head of Saint Anne. The Latin titletranslates roughly as “through difficulties to the stars” and was a sentiment that could loosley be said to be the motto for Unmitigated Audacity Productions. In order to secure access to the to this highly desirable wall we used a faked letter from the City of Sydney Council that informed the occupiers that their house had been selected for a free council sponsored mural. Despite some issues with the real estate agent about its emergence on the wall of this rented home it lasted for some time (about three years). It was painted by Andrew and myself and was Artist funded.The image on the left in of me and Andrew posing in front of the mural. 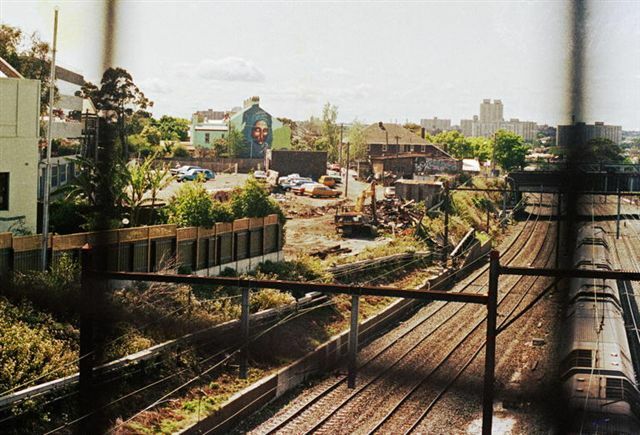 The image on the right was shot from the the top platform of Newtown station and shows why this particular wall was chosen for this mural. It was hugely visible to thousands and thousands of train travellers every day. 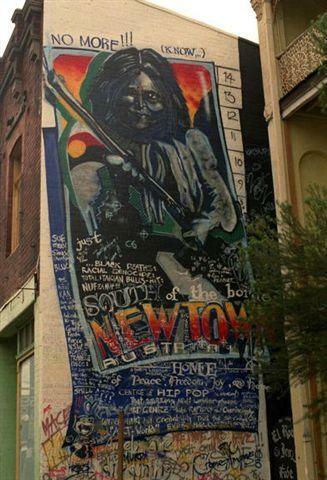 This mural is situated on King Street Newtown across from the Post Office and was painted over two nights in August 1991by Andrew Aiken and Juilee Pryor with the help of others notably Tony Spanos who provided us with a cherry-picker to use on the second night. This mural was Artist funded. After a few months of persistent argument between the local community Arts Officer and Unmitigated Audacity Productions there came a point where there was nothing left of the original base and so Andrew painted it out completely and in its place put up a Declaration of Independence with an invitation for people to sign the document. Which they did, this became the incident that led to the Aboriginal Flag being painted in that spot. 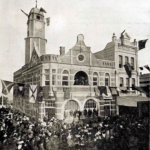 The council had by now removed the garden bed completely and that allowed the Aboriginal flag to be proudly inserted in that space and there it has remained ever since. The mural quickly became the centre of community events and a natural meeting spot In this image the annual Walking the Street event was opened at the mural and this was also a way for the community to celebrate the mural’s place within the parameters of the vibrant local ats scene.